Jamaica’s Reggae Chess Kidz swamped the competition winning 12 trophies at the annual Miami Junior Orange Bowl International Scholastic Chess Championships in Florida. They overcame the USA, Venezuela, Mexico, Trinidad and Tobago and Ecuador to place first and second in taking three team and nine individual awards and a host of other prizes in the three day event which ended on December 29, 2010. Reggae Chess Kidz 9 and Under team of Brandon Daley, Zara Ranglin, Michael Lowe and Ché Hutchinson Serju celebrate with officials at the Miami Junior Orange Bowl International Scholastic Chess Championships. The 22 member Reggae Jamaica Chess Team – sponsored by Chess Enterprise (CE), Wechess, and Chess Whiz Kids competed with 100 players in the Under 6, Under 9, Under 12, and Under 15 categories. The A and B teams for Under 9 walked away with first and second place respectively. The Under 9 A team comprised Ethan Chan, Leighton Barrett, Nathan Chin, and Nathan Walsh and the Under 9 B team consisted of Brandon Daley, Michael Lowe, Zara Ranglin, and Che Hutchinson Serju. The Under 12 A team of Elias Issa, Rachel Miller, Lawrence Foreman, and Sheanel Gardner copped the second place trophy. The corresponding B team with Justin Lowe, Jorie Japp, and Kevin Coward-Robinson earned fifth place. Jonathan Orgill collected the third place prize for the Under 15 age group individual trophy, and Jason Lawson secured the sixth prize for the same division. Joshua Orgill, Jordan Lowe, and Lyle Forbes walked away with twelfth, fourteenth, and fifteenth place respectively. The young chess players were coached by Adrian Palmer, NM Ryan Blackwood, FM Warren Elliot and Margo Williams. The coaches are proud of the performance of the Jamaicans plan continue competing internationally to develop the local chess talent. 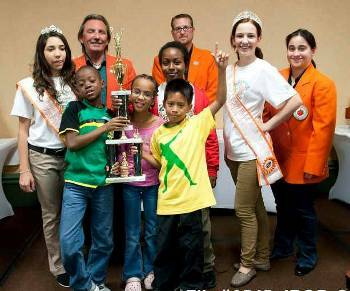 The Junior Orange Bowl International Scholastic Chess Championships is part of the Junior Orange Bowl Youth Festival started in 1948 billed as “the largest international youth sports and arts festival”. In 1998, the festival introduced its inaugural International Scholastic Chess Tournament, which hosts some of the world’s best young chess minds.